When bacteria or viruses invade the body, the immune system releases white blood cells and antibodies to fight the infection and prevent serious illness. Once the infection is over, the body is left with “memory cells,” which remember how to destroy the germ if the body were to become exposed to it again in the future. Vaccines work by imitating serious infections without causing illness. The immune system responds to vaccines in the same way it would to a real infection – by forming memory cells. These memory cells protect against real, serious infections if the body were to be exposed in the future. Vaccines are extremely important in preventing dangerous – sometimes deadly – diseases. In addition to being harmful, these diseases are also highly contagious. Herd immunity occurs when a community is protected against an outbreak because a significant portion of individuals in the community are immunized. There will always be some people who cannot get vaccinated (for example, newborns and individuals with compromised immune systems), so it is crucial that all medically-able individuals are immunized in order to prevent the spread of disease. Research has shown that vaccines are safe, effective, and have had a positive impact on population health. Before vaccinations were available, infectious diseases were the leading cause of death in the United States. In the early 20th century, the rate of deaths from infectious diseases was over three times higher than the next leading cause of death – heart disease.1 Therefore, infectious diseases significantly contributed to the shorter average life expectancy of about 47 years at the time. Today, infectious diseases are no longer a leading cause of death due to high rates of vaccination. This has substantially contributed to an increase in average life expectancy to 78 years. However, infectious diseases are still very prevalent in other countries. Since world trade and tourism can spread diseases to all areas of the world, it is still important that everyone who is medically able vaccinates. The CDC recommends receiving vaccinations for the diseases below. Parents should consult a physician about which vaccinations their children should receive and when they should receive them. Note: Some vaccines require multiple doses to be effective. Note: Chart includes only schools (with ≥10 kindergarten students) for which data were reported. Number of students in each county varies (Min: 25, Max: 129494). 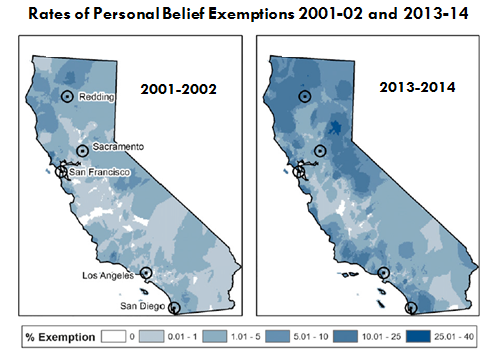 Therefore, while herd immunity may be adequate in some regions of California, there are other areas for which low vaccination rates pose a threat to children’s health. Reducing the use of PBEs would lead to higher vaccination rates, which would strengthen herd immunity in these areas. Measles is a highly contagious viral disease, which can lead to serious illness or death. Between December 2014 and January 2015, a measles outbreak in Disneyland (Anaheim, California) affected at least 125 individuals. Of the 110 California residents affected, roughly half (45%) were unvaccinated, 43% had unknown/undocumented vaccination status, and another 5% were only partially vaccinated. According to a recent report, California had the 2nd highest number of cases of measles in the United States. California prohibits public or private schools, child care centers, and similar institutions from accepting incoming students who have not received recommended vaccinations. Prior to SB 277, the law allowed an exemption to this mandate for individuals (1) for whom vaccines would not be safe due to a medical condition, such as a child who is undergoing chemotherapy, and (2) who have personal beliefs against immunization. Senators Pan and Allen introduced Senate Bill 277 to eliminate the personal beliefs exemption (PBE). The goal of this bill is to promote health and safety in schools by increasing herd immunity. Children with medical exemptions provided by physicians, home-schooled and independent study students who have no classroom based instruction are exempt from the requirements of the bill. Opponents of SB 277 argued that individual freedom and parental rights will be compromised if the bill is enacted into law. However, similar to distracted driving or smoking, choosing to not vaccinate endangers not only the individual, but also others around them. Public health is a compelling interest to limit some individual rights. Opponents are also sometimes concerned that vaccines are not safe and can have dangerous side effects. While there is a risk of side effects such as swelling and soreness around the injection site, as well as very rare instances of allergic reactions to vaccines, well-conducted research studies have not found a link between vaccines and serious illnesses. Finally, some opponents have argued that the measles outbreak was not sufficiently widespread to constitute a medical emergency. However, the purpose of vaccines is to prevent outbreaks before they happen. Therefore, waiting for a pandemic would defeat the purpose of vaccinating the public. Established medical and public health institutions and organizations strongly support vaccination and the efforts of SB 277.